About 10 years ago the competition for the 7 modern wonders of the word resulted in the selection of the 7 New Wonders of the World. 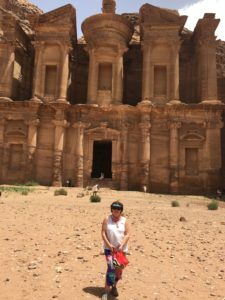 Petra came in second, just after the Great Wall. Today our group wholeheartedly affirms that this place is deserving of this honour. The Lord really answered prayers as we had amazing weather. Even in the morning we were told to expect a downpour by 1pm, but there were no dark clouds on the horizon and the whole day was picture perfect and even a tad cooler than usual this time of year. 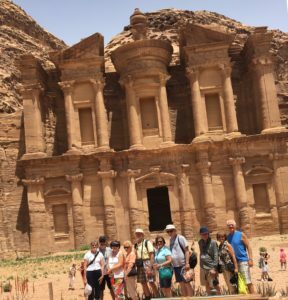 Our amazing hotel – The Petra Guest House – has the best location, the front door to Petra is just outside our lobby. 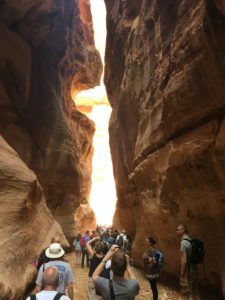 Our group set out and there was much to see on the way and in the Siq. The view of the Treasury always takes the breath away. Here we are in front of the Treasury. Some of us stayed in the valley, but a group of us decided to climb the 850 stairs to the Monastery. Those with step counters on are sure that it way more than 850 stairs. The climb takes about 45 minutes, at an easy pace. 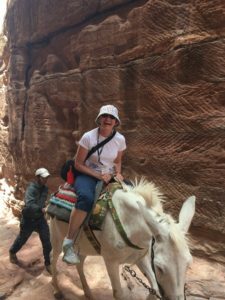 A mule ride makes the hike accessible for those who might not manage it otherwise. 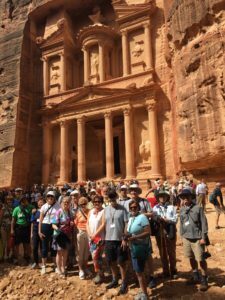 This is the pay-off – the beautiful Monastery on top of Petra. Here are some of those who made it up. 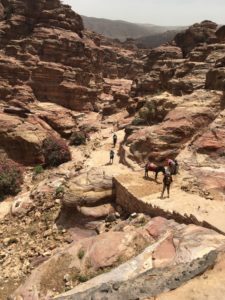 Here is an epic shot of Hedie riding a camel out of the city of Petra. 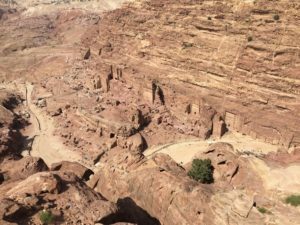 Brian, Scott and Wayne had enough left in the tank to make a second challenging climb – to the High Place of sacrifice. 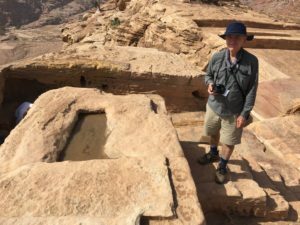 Besides this spectacular view of the city the High Place of sacrifice has ancient altars used to make offerings to the various gods worshipped here. 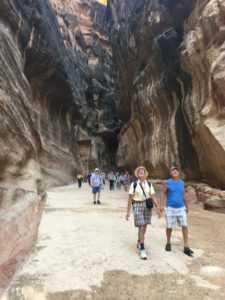 Total step count today was 26,000 (much more for those who made the climb to the High Place)…so we are a bit sore and looking forward to crossing back into Israel tomorrow for a day of recouping in Eilat on the Red Sea. Thanks for the blogs. Your trip is so interesting. Looking forward to your return . Amazing. Glad to see my folks made it to the Monetary. 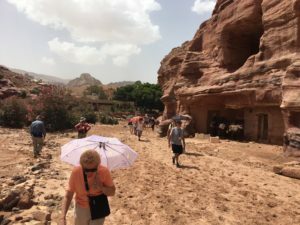 The water system that was designed for Petra was absolutely incredible.